NZDUSD is chiefly under the influence of the economic reports in the US such as the Natural Gas Storage, CB Leading Index m/m, New Home Sales, Flash Manufacturing PMI, and Unemployment Claims. NZDUSD is moving with bullish bias in both short and long term. 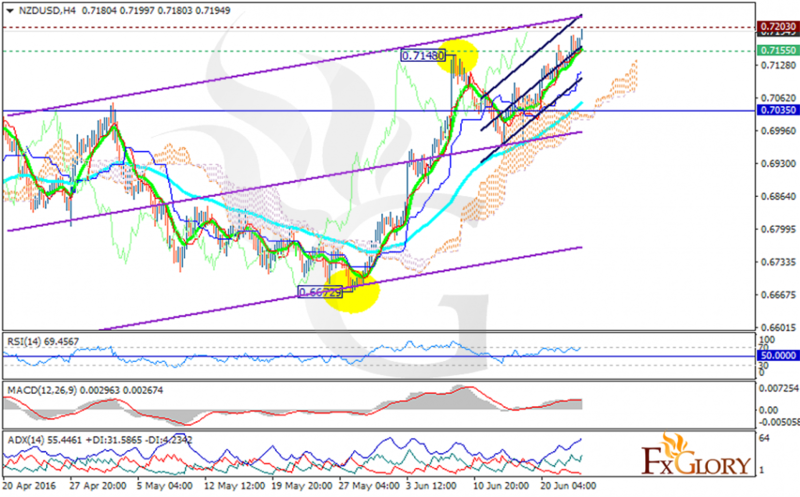 The Support lies at 0.71550 with resistance at 0.72030 which both lines are above the weekly pivot point at 0.70350. The price is above the Ichimoku Cloud and the Chinkou Span. The Tenkan-sen and the Kijun-sen are both showing upward movement. The ADX is showing strong buyers as well. However, the RSI has already reached the overbought area and there is a slight chance of pullbacks. The MACD indicator is also in positive territory. The pair is moving upward at the moment, bulls are not leaving the chart.